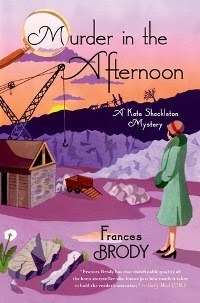 Frances Brody's Murder in the Afternoon successfully melds the British historical saga and the traditional crime novel. The plot and characters reflect the era: the socially turbulent 1920s, when working men fought for fair treatment, liberated career women met with patronizing attitudes, and people across England struggled to emerge from the Great War's long shadow. In this third entry in an ongoing series, it's May of 1923, and thirtyish war widow and private investigator Kate Shackleton gets awakened at 4am by a woman who needs her help. Mary Jane Armstrong's husband Ethan has disappeared from the quarry where he worked as a stonemason. Their ten-year-old daughter Harriet says she found him lying dead in his hut after bringing him lunch the day before, but his body has vanished, and the local police don't believe her. Ethan, a charismatic leader, had been organizing a strike at the quarry; in addition, he and Mary Jane had argued just before he left for work. The blue slate sundial he'd been crafting for his boss is found crushed in pieces. Did he smash it in revenge before abandoning his wife and family, or was he murdered? Clues to this complex puzzle are intricately woven into the story as Kate discovers a startling family connection to Mary Jane and encounters resistance from an unexpected place. Kate has a quick, wry wit that makes her narrative a lot of fun to read. "His eyebrows arched high enough to let a train of hostile thought pass," she says of an old-school police sergeant who's suspicious of female detectives. With her confident demeanor and gentle upbringing, Kate knows how to get things done, remaining aware of the "Yorkshire caution" she knows she'll find among the residents of Great Applewick. One minor distraction is her tendency to step back from what's happening and make present-tense observations; this takes some getting used to. Because of Ethan's political activities, Kate's lover from Scotland Yard gets brought in, but it takes someone with Kate's brand of determination and sly thoroughness to crack the case – with the help of some clever undercover work by her partner, Jim Sykes. Brody's knowledge of the geography, housing, and speech patterns of working-class Northern England adds to the convincing atmosphere, as do her depictions of "country children." Although two Kate Shackleton novels precede this one, Brody doesn't waste time getting readers up to speed with her characters. The solutions to the earlier mysteries aren't revealed here, either, which should give those new to the series more to look forward to in her backlist. As Frances McNeil, she has also written many novels set in and around her home city of Leeds; her Somewhere Behind the Morning won the HarperCollins Elizabeth Elgin Award for the Most Regionally Evocative Saga of the Millennium. Murder in the Afternoon is published on February 11th by Minotaur in the US ($25.99/$29.99 in Canada, hardcover, 387pp). It's also available in the UK from Piatkus in paperback (£8.99), with the same gorgeous original artwork on the cover. Thanks to the publisher for sending me a review copy. Oh, I think I would like this. I enjoy the 1920's as a background! So do I - especially as this one goes into detail on what real life was like for the working-class at the time. I think I might as well -- an author I shall look for. Besides -- Yorkshire, one of the beautiful, if hard, places in the world. I've been to York and to Harrogate - while visiting friends I knew there - but haven't spent time in the Yorkshire countryside aside from what I saw via train. I've read many Catherine Cookson-style sagas set there, though, as well as the Brontes' work, of course. The difficult times produced tough, resilient people. I'd gladly read another of Frances Brody's mysteries, and will look through my shelves for copies of her sagas; I suspect I have a few around here. I'm going to have to check this series out. Thanks for sharing your review, Sarah. I'm glad I read this one - one of those wonderful, unexpected discoveries! Hi Anon, thanks for your comments! I've read the first two in this series...thanks for letting me know the new one is out! It'll be out a week from today! And I see there are already two more out in the UK... I hope they'll be published in the US later as well.